When you need professional experience with a personal touch. 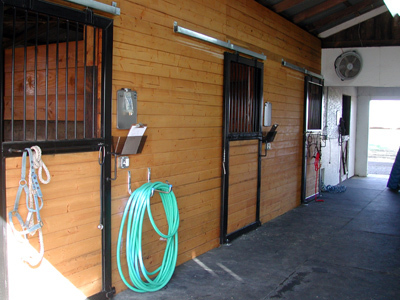 The Willow Oak Equine Clinic was established by Butch Harrison and his wife Dr. Linda Harrison (formerly Linda Van Hoogmoed). Dr. Harrison is a 1992 graduate of UC Davis School of Veterinary Medicine, interned at Rood and Riddle Equine Hospital in Lexington, KY in 1993 and completed a residency in Equine Surgery at UC Davis in 1996. She received her PhD in Comparative Pathology with an emphasis on Equine Gastrointestinal research in1999. Dr. Harrison was a faculty member in the Department of Equine Surgery at UC Davis for 10 years but left the University to pursue private practice. Dr. Lisa Wallace has her own practice but works with our clinic also. She has extensive ultrasound and rehabilitation experience and coordinates the Ultrasound and Reproductive Service and provides general anesthesia support for patients undergoing surgical procedures. The clinic philosophy is to provide state of the art quality service and personal care to both clients and their patients. It's easy to get lost in the shuffle of large institutions that may practice more assembly-line medicine and less bed side manner. We have always believed the client and their patient comes first and want to restore that "country feel" that comes with sincere compassion for the owner and their horse. Copyright 2010 Willow Oak Equine. All rights reserved.